Lighthouses have guided sailors, adventurers, and dreamers throughout the world for centuries. And a very important lighthouse stands tucked beneath the great gray span of the George Washington Bridge on the Hudson River. This timeless and thoroughly charming story reveals how the proud little red lighthouse learned that even though it was very small, it was still mighty. HILDEGARD HOYT SWIFT (1890-1977) wrote several books for children. Best known for "The Railroad to Freedom," which was cited for a Newbery Honor in 1933, Ms. Swift spent her life recording the lives of heroic Americans on paper. 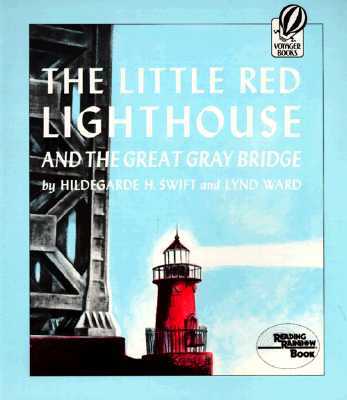 "The Little Red Lighthouse and the Great Gray Bridge "is her most popular picture book. LYND WARD (1905-1985) illustrated more than two hundred books for children and adults throughout his life. Winner of the Caldecott Medal in 1952, for illustrating "The Biggest Bear," Mr. Ward created works that now can be seen in many museum collections throughout the United Staes and abroad.